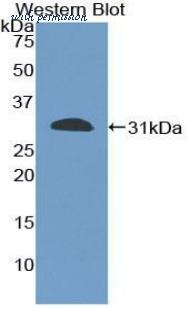 IL-2 secretion Induced by B7-2/CD86 and Neutralization by Mouse B7-2/CD86 Antibody. 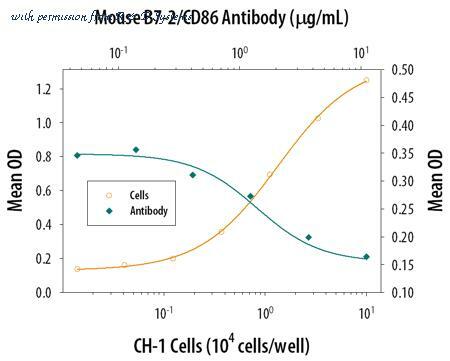 Recombinant Mouse B7-2/CD86 Fc Chimera (Catalog # 741-B2 ) co-stimulates IL-2 secretion in the Jurkat human acute T cell leukemia cell line in the presence of PHA in a dose-dependent manner (orange line), as measured by the Human IL-2 Quantikine ELISA Kit (Catalog # D2050 ). 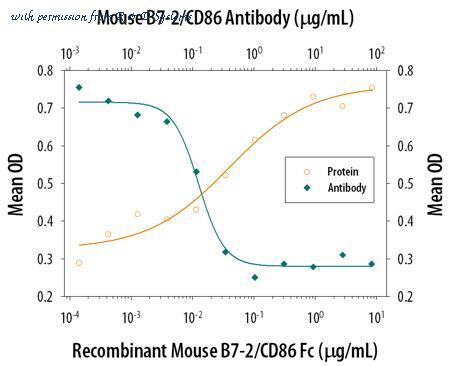 IL-2 secretion elicited by Recombinant Mouse B7-2/CD86 Fc Chimera (0.5 ╡g/mL) and PHA (10 ╡g/mL) is neutralized (green line) by increasing concentrations of Rat Anti-Mouse B7-2/CD86 Monoclonal Antibody (Catalog # MAB741). The ND50 is typically 0.05-0.25 ╡g/mL. IL-2 Secretion Induced by CH-1 Cell Surface B7-2 and Neutralization by Mouse B7-2/CD86 Antibody. The CH-1 mouse B cell lymphoma cell line, which expresses B7-1 and B7-2 on the cell surface, co-stimulates IL-2 secretion in the Jurkat human acute T cell leukemia cell line in the presence of PHA (10 ╡g/mL) in a dose-dependent manner (orange line), as measured by the Human IL-2 Quantikine ELISA Kit (Catalog # D2050 ). Under these conditions, IL-2 secretion elicited by CH-1 cells is neutralized (green line) by increasing concentrations of Goat Anti-Mouse B7-2/CD86 Antigen Affinity-purified Polyclonal Antibody (Catalog # AF-441-NA). The ND50 is typically 2-5 ╡g/mL. Flow Cytometry: B7-2/CD86 Antibody (BU63) [NBP2-25208] - Surface staining of CD86 on 10^6 PBMC using 0.25 ug of CD86 antibody. 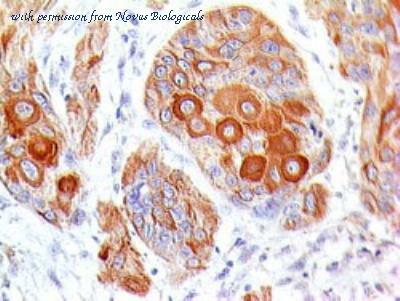 Immunohistochemistry-Paraffin: B7-2/CD86 Antibody (BU63) [NBP2-25208] - Formalin-fixed, paraffin-embedded esophagus tumor tissue stained with CD86 antibody (5 ug/ml), peroxidase-conjugate and DAB chromogen. 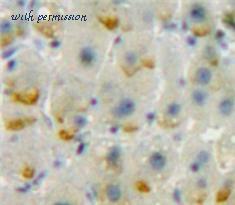 Note strong staining of differentiated squamous cells. TMA was used for this test. Knockout Validated: B7-2/CD86 Antibody (GL1) [NBP2-30148] - Lysates of Ramos human Burkitt's lymphoma parental cell line and B7-2 knockout (KO) Ramos cell line. 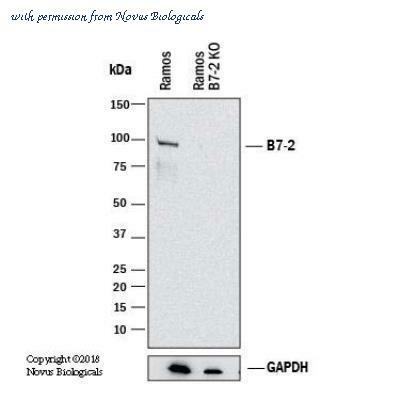 PVDF membrane was probed with 1.0 ug/mL of Rat Anti-Human B7-2 Monoclonal Antibody (Catalog # NBP2-30148) followed by HRP-conjugated Anti-Rat IgG Secondary Antibody (Catalog #HAF005). 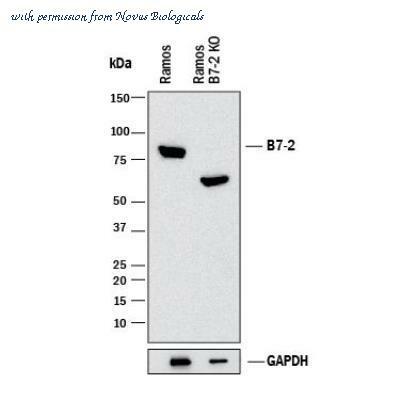 Specific band was detected for B7-2 at approximately 80 kDa (as indicated) in the parental Ramos cell line, but is not detectable in the knockout Ramos cell line. This experiment was conducted under reducing conditions. Knockout Validated: B7-2/CD86 Antibody (C86/1146) [NBP2-44514] - Western blot shows lysates of Ramos human Burkitt's lymphoma parental cell line and B7-2 knockout (KO) Ramos cell line. PVDF membrane was probed with 1.0 ug/mL of Mouse Anti-Human B7-2 Monoclonal Antibody (Catalog # NBP2-44514) followed by HRP-conjugated Anti-Mouse IgG Secondary Antibody (Catalog #HAF018). 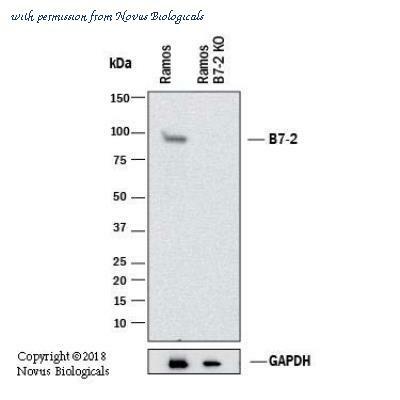 Specific band was detected for B7-2 at approximately 90 kDa (as indicated) in the parental Ramos cell line, but is not detectable in the knockout Ramos cell line. This experiment was conducted under reducing conditions. 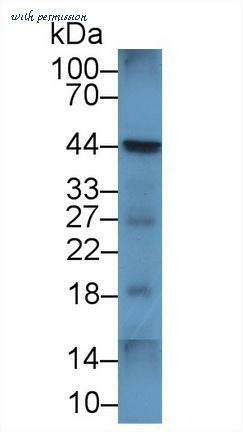 Western blot of recombinant CD86. This image was taken for the unconjugated form of this product. Other forms have not been tested.